Insulation damage occurred on a 48-inch diameter steam turbine crossaround pipe at the Cook Nuclear Plant in Bridgman, Michigan. In addition, there was fracture of a 2-inch drain line connected to an 8-inch drip leg near the turbine end of the pipe. Fracture of the 2-inch pipe occurred at a socket weld connection. The damage was found after a turbine trip. To further investigate this incident, the Indiana Michigan Power Unit of American Electric Power (AEP) sought vibration analysis of the insulated steam pipe, drip leg and attached drain line. AEP contacted O’Donnell Consulting Engineers, Inc. requesting an evaluation of the design including the vertically-acting spring supports. 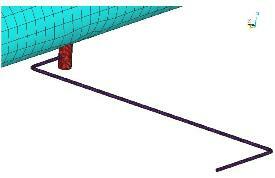 An investigation was completed using computer modeling in conjunction with the finite element method. See Portfolio to read descriptions of our various projects. For a short listing of books, databases, and other engineering resources, visit our Links page.